Zouheir El Mufti of Morocco, Masahiro Sumi of Japan, Pedro Brandao of Portugal, John Rohloff of Australia and Sandy Pickering Drake of the USA. El Mufti is the senior statesman among the officiating crew. Daily News of Open Water Swimming: You are a professor of physics and chemistry. How did you integrate the sports field and specifically swimming? Zouheir El Mufti: Since my childhood, I have always been passionate about sport. I played volleyball and handball with the WAC clubs and ASUC in the late seventies. I started my work in swimming through the Club du Chabab Zerktouni (CCZ) at the age of 23 as a leader. Then I joined the Royal Moroccan Federation of Swimming (FRMN) as a member of the Technical Commission of 1986. A year later, in 1987, I became a member of the Federal Bureau. The members of the technical commission are responsible for the selection of national teams, the training of coaches and the monitoring of club training in the ministry's swimming pools. I attended formal training courses for officials in Morocco as a federal member. I know the technical regulations of swimming. In 2000, I joined the African Confederation of Swimming (CANA). The members of the CANA Technical Committee are automatically international referees. Daily News of Open Water Swimming: What do you think about the current level of swimming in your country? Zouheir El Mufti: The level of swimming is progressing. 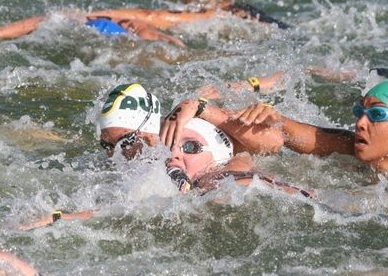 However, the majority of the swimmers who make up the raw material are all students. As a result, they are not always available unlike swimmers from other neighboring countries. Training sessions by national swimmers are insufficient. Currently, we are working to create regional training centers in Casablanca, Rabat, Meknes, Fez and Marrakech. We have prepared projects that are being studied with the appropriate ministry. There are seven clubs in Casablanca and thirty in Morocco. The Ministry of Youth and Sports takes care of the elite while the mass sport is organized at the level of the clubs. The municipalities on which the clubs depend are to build sports halls, swimming pools and the necessary infrastructures for the promotion and popularization of sport. Today, the number of practitioners of swimming in Morocco is over 2,500 swimmers. An additional footnote to the competition will be the potentially interesting dynamic between Great Britain's Jack Burnell and the FINA officiating crew including the El Mufti and the American representative. At the 2016 Rio Olympics, Burnell was disqualified for two yellow cards. At the 2017 USA Swimming National Open Water Swimming Championships, Burnell received a red card for unsportsmanlike conduct during the race - and he refused to get out of the water as required by FINA rules. Burnell told the BBC after his disqualification, "The whole thing [officiating] is a joke. I was disqualified two metres from the finish. No-one was either side of me and he pulls out a yellow card. I could not physically have touched anyone and I got a yellow card. I shook my head at the guy. This is meant to be the pinnacle of our sport and there are referees who have not got a clue what they are doing." Burnell continued that mindset in California where he purposefully rolled over on his back and took direct aim at Andrew Gemmell's head with the heel of his foot during the last loop of the American 10 km championships. The act of aggression was not only caught on film, but also witnessed by the referees on the lead officials boat [see here]. "Despite numerous whistles and waving of the red flag over the next kilometer, Burnell refused to acknowledge his kick at the head of Gemmell and more shockingly, he refused to acknowledge the decisions of the head and assistant referees. He just continued to swim on as if nothing happened and nothing was his fault," observed Steven Munatones. "That act of defiance evidently had no repercussions and no ultimate effect except that is affected the race and ultimate placing of Gemmell. So while Gemmell did not qualify for the World Championships in Lake Balaton in the 10 km race, British Swimming awarded Burnell with a position on the British team." “I am out here to win every single race I go into, I am not out here to come second, third or fourth. So for me it’s about turning up to races in the best possible shape I can and showing people what I can do,” said Burnell after winning a FINA 10K Marathon Swimming Grand Prix. At 1 hour 39 minutes into the video above, Burnell can be seen looking up at the referee for Gemmell's drafting off of him, apparently because Gemmell was touching his feet in the draft. Burnell turns up his kick to ward Gemmell off of him. This physicality continues for the next few minutes. The confrontation finally escalates at 1 hour 42 minutes and 55 seconds into the swim when Burnell finally turns around and takes an aim with his foot to the head of Gemmell. For this act of unsportsmanlike conduct, he is immediately red carded and is repeatedly asked to leave the venue which he ignores for the entirety of the race. Whistles can be heard as the head referee and assistant referees on the boat wave red flags, point to him, yell at him, and write his race number on the whiteboard to indicate that he must leave the course. Upper photo by Javier Blazquez shows American Christine Jennings, surrounded by German Olympian Angela Maurer on her left, Australian Olympian Melissa Gorman on her right, and Brazilian Olympic bronze medalist Poliana Okimoto, in the 5 km race at the 2008 World Open Water Swimming Championships in Sevilla, Spain - an example of open water swimming physicality including impeding that can lead to a yellow card.